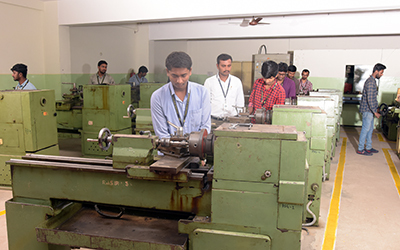 The Department of Mechanical Engineering was started in the year 2004-2005 with an intake of 60 students and the same has been enhanced to 120 students by AICTE during academic year 2013-14. Mechanical Engineering is a discipline that use materials science, mathematics to design and applies principles of physics. Engineers use these core principles along with tools that aid in developing aircraft’s, industrial machinery and equipment’s, heating and cooling systems, etc. 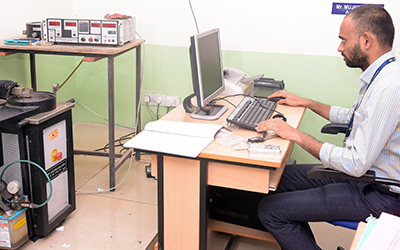 Mechanical Engineering Department is the most sought for its practical real-world oriented teaching practices. 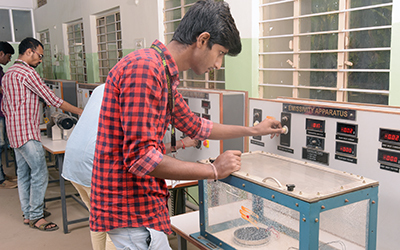 Mechanical Engineering department has laboratories at par to IIT’s and NIT’s of India and one ranked the best engineering colleges for Mechanical Engineering in Karnataka, India. The department is recognized as a research center since 2014. 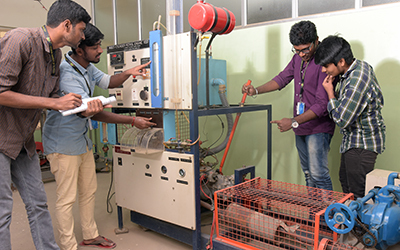 The department has well-equipped laboratories for testing and conducting research in the field of impact energy absorption, alternate fuels and composite materials. 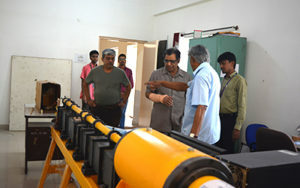 The department has also set up unique test facilities such as Drop weight testing machine, Computerized wear testing machine, Ballistic impact test apparatus and Computerized multi-fuel test facility with the support of the management of Karnataka ReddyJana Sangha. 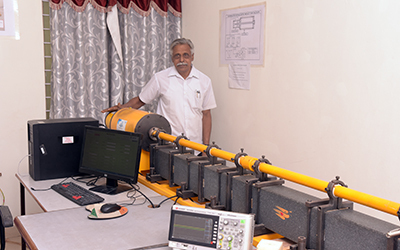 These machines cater to the research requirements of R & D programs for the faculty and students. The well experienced and dedicated faculty members are the backbone of this department. They are actively involved in nurturing the best of candidates in this emerging field of engineering. Also the placement record of the passed out students is reasonably satisfactory. 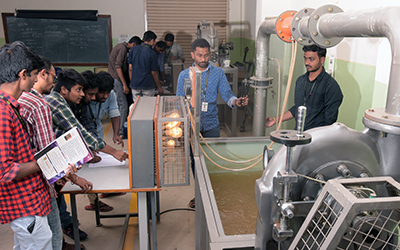 Mechanical Engineering Department of Vemana Institute of Technology, Bengaluru is highly preferred choice for this domain by students opting for engineering courses. To be recognized in the field of mechanical engineering education and research to produce competent engineers. • To impart technical education through effective teaching-learning methods. • To create research ambiance to face the current technological challenges for the benefit of society. • To strengthen industry-institute interface for developing teamwork, internship and entrepreneur skills. Dr.Vijayasimha Reddy B.G. Professor, Principal, M.E. 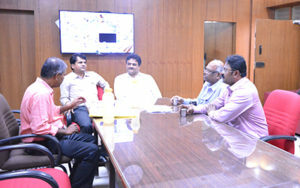 Ph.D.
Dr. Lokesh G. Reddy Professor & Head, B.E.,M.E., Ph.D.
Dr.T.Yella Reddy Professor, M.E. 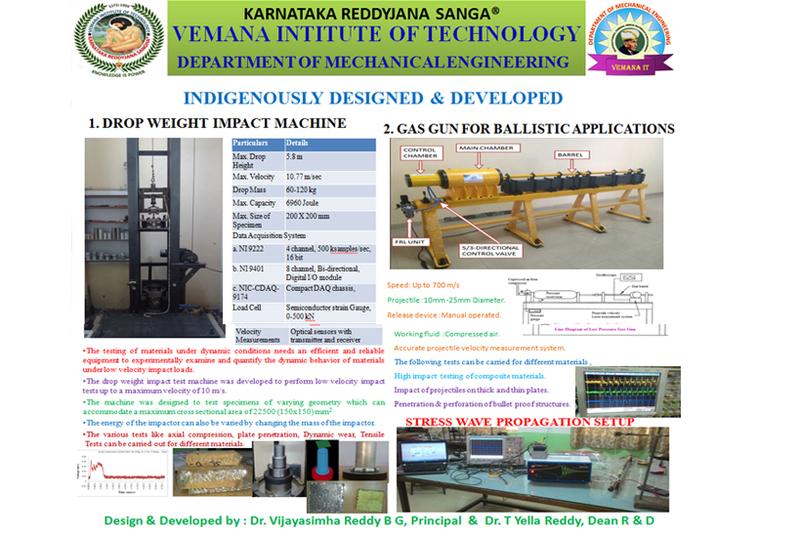 Ph.D.
A High velocity “Ballistic Impact Test Apparatus” indigenously designed, developed and commissioned by the Department of Mechanical Engineering. 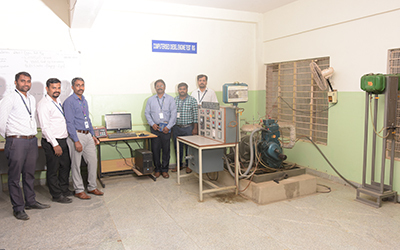 “ISTE Student Chapter Activities was started by the Department on 28th February 2015"
The department has indigenously designed, developed and commissioned a “DROP WEIGHT IMPACT TEST MACHINE" for dynamic tests which is unique in the academic field. 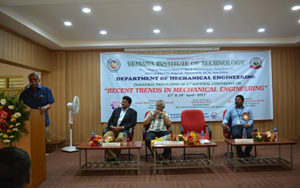 3rd National Conference on Recent Trends in Mechanical Engineering (RTME-17). 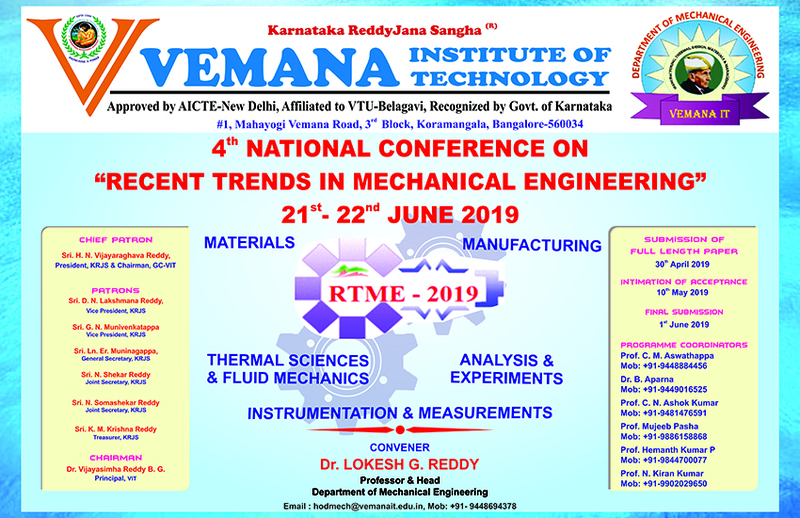 We are happy to inform you that, 3rd National conference on Recent Trends in Mechanical Engineering-2017 (RTME-17) has been successfully completed on 27th and 28th April 2017 at our institute (Vemana Institute of Technology, Bangalore). The inaugural function of the program was held on 27th April 2017. 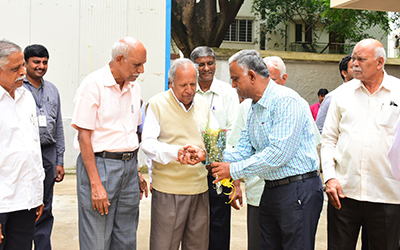 Dr. Vijayasimha Reddy B.G., Chairman RTME-17 & Principal, Vemana IT welcomed the gathering for the function. 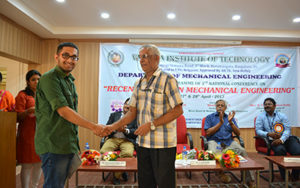 Prof. S. Mohan of Department of Mechanical Engineering gave the overview of RTME-17. The chief guests for the function were Padma Bhushan Dr. B. N. SURESH President, Indian National Academy of Engineering, Delhi and Mr. Shashidhara H.N. Technical Expert, Micro Small & Medium Enterprises, GIZ, Bangalore. 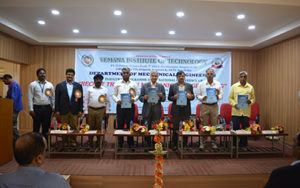 The inaugural program was followed by key note address by Padma Bhushan Dr. B. N. SURESH on “Mechanical Engineering Challenges for the 21st Century” followed by presidential address by Shri. H. N. Vijayaraghava Reddy, President, KRJS, Chairman Governing Council, Vemana IT. The inaugural program was conclude with vote of thanks by Lokesh G. Reddy Convener, RTME17. 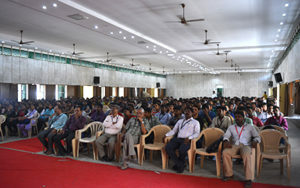 The conference covered the important areas of Mechanical Engineering viz., Design, Materials, Manufacturing, Thermal sciences, Data acquisition & Instrumentation. There were 34 papers presented under 4 sessions. 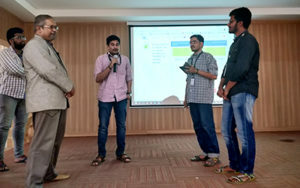 Each session had an invited talk by an eminent personality who was also the session chairman followed by paper presentations by the participants. It started with session on manufacturing which was chaired by Mr. V.D. 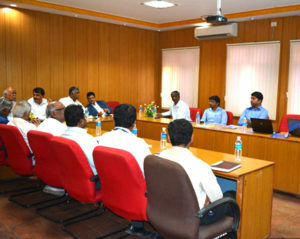 Ragupathy, ISRO Bangalore and co-chaired by Prof. S. Mohan, VIT, Bangalore. The invited talk for the session was given by Mr. V.D. Ragupathy “Key Manufacturing Technologies for Aerospace Applications”. 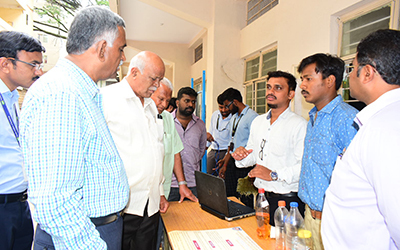 The second was on design which was chaired by Dr. A. Deb, Professor, IISc, Bangalore and co-chaired by Dr. T. Yella Reddy, Dean R & D, VIT. 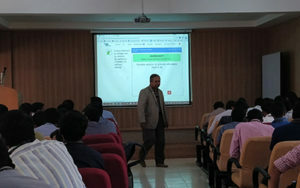 The invited talk for the session was given by Dr. A. Deb on “Recent trends in CAE-driven vehicle design for crashworthiness and occupant/pedestrian safety”. Second day first session started with session on Materials and Instrumentation which was chaired by S. Raviprakash, MD & CEO, Pyrodynamics and co-chaired by Dr. A. Ramachandran, Professor ECE, VIT. 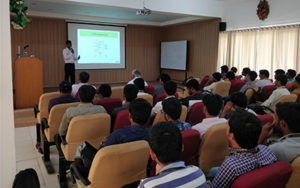 The invited talk for the session was given by Mr. S. Ravi Prakash on “Digital Image Correlation for non-contact full field deformation measurement of materials and components”. 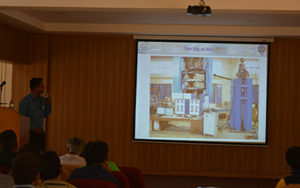 Final session was on thermal sciences & fluid mechanics was chaired by Mr. Shashi Shekar R., Group Head,Bi-propellant and Propellant Management Group, ISRO Bangalore and co-chaired by Mrs. Aparna, Prof. VIT. The invited talk for the session was given by Mr.Shashi Shekar .R on “Spacecraft Propulsion – Criticalities and Solutions”. 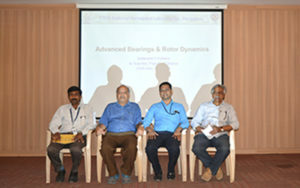 The conference was concluded with valedictory program on 28thApril evening. 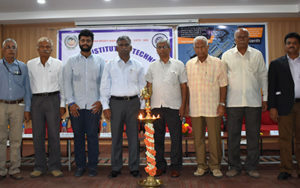 Department of Mechanical Engineering has organized a workshop training program in collaboration with Karnataka German Technical Training Institute for the students of mechanical engineering. 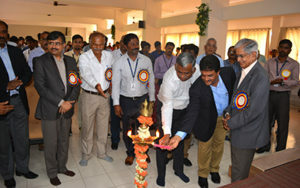 The program was inaugurated by Sri. Ln. Er. 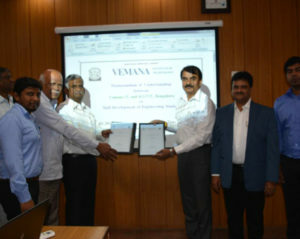 MUNINAGAPPA, General Secretary, KRJS and Dr. T. Yella Reddy, Dean R&D, Vemana IT. The program was scheduled for 20 days for a total number of 160 hours. 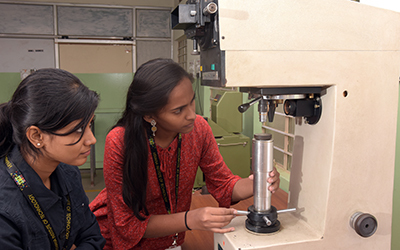 Around 30 students of mechanical engineering took benefit from this program. These students underwent training in Manufacturing Technology especially on CNC Turning Operation, CNC Milling Operation, and CATIA v5. 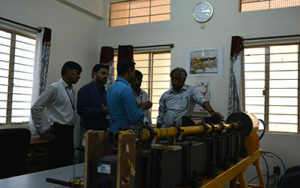 Students were also trained on Pneumatics & Hydraulics under Industrial Automation. It’s an 8 days internship programme organized by Dept. of Mechanical engineering under the banner of ISTE and conducted by Ezenith educations Mumbai. 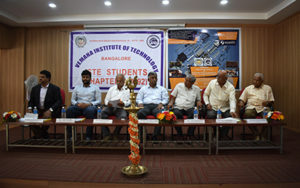 The event was inaugurated by Dr. Vidyashankar.S, Member Executive Council, ISTE (HQ), Professor BIT, Bengaluru. 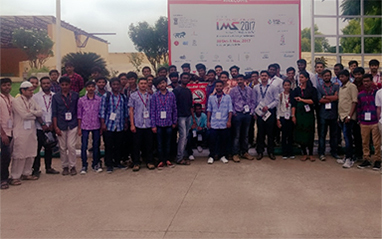 More than 140 students from various different colleges in India have participated in the event, including 25 students from Vemana IT. Students took 20hrs of hands-on experience on engine assembling and disassembling. 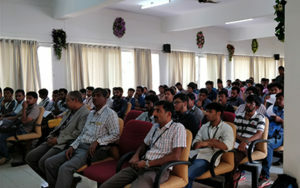 Various R & D experts educated students for more than 40hrs. 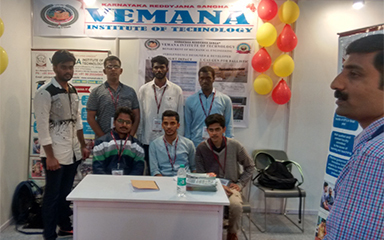 An intercollegiate student project and poster exhibition “Vemana Techno Fest 2018” was organised at Vemana Institute of Technology on 11/06/2018. Dr.A. 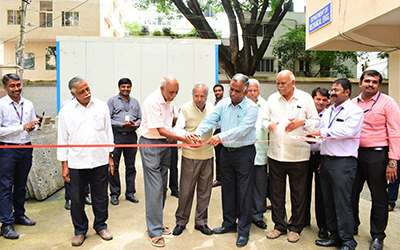 C. Bhaskar Naidu, Former principal of BMS college of Engineering and Dr. Ranga, former principal of Vemana I.T, inaugurated the exhibition for Mechanical Engineering Department. This event highlighted the work the students had completed in their final year course. It was an occasion where final year students could teach other pre final students about the practical relevance of their projects. 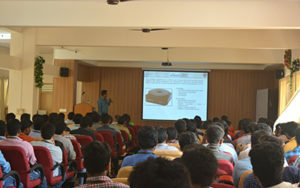 Wide spectrums of projects were presented covering different areas of Mechanical Engineering. 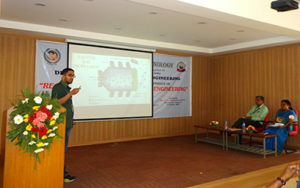 Projects were on deformation studies of Impact energy absorption, polymer matrix composites, natural composites, fabrication of agricultural equipment, non-conventional energy sources, automatic hand brake system, studies on bio-fuels, stress wave propagation, besides other topics of Mechanical Engineering. A total of 25 projects got displayed from which 3 were selected for cash awards. 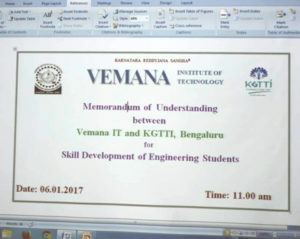 The Memorandum of Understanding between “Karnataka German Technical Training Institute, Bengaluru (KGTTI) and Vemana Institute of Technology, Bangaluru" was signed on 6th January 2017 by Sri. 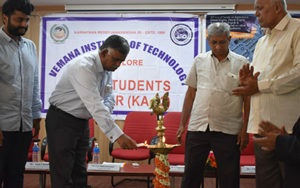 T. Jayarama, Director, KGTTI, Bengalore & Sri. Ln. Er. 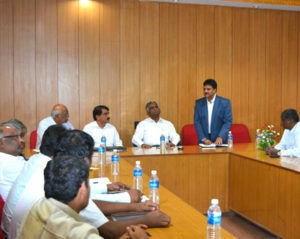 Muninagappa, General Secretary, KRJS, in the presence of Sri. H.N. 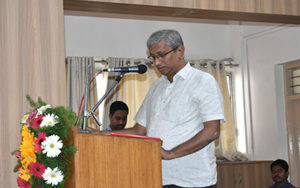 Vijaya Raghava Reddy, President, KRJS, Sri. 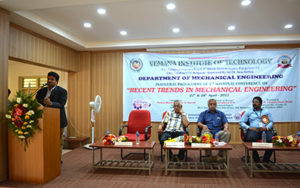 Dr. T. Yella Reddy, Dean, R & D, Sri. Dr. Vijayasimha Reddy. 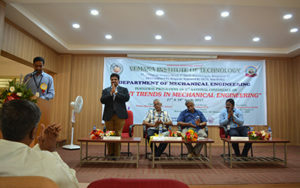 B. G, Principal, Vemana Institute of Technology, Dept. heads & other staff. The main objective of the MoU is to provide the Skill development to our engineering students in the areas of Advanced Technology, Hands-on Training to enhance employment opportunities & a solid foundation for further studies. 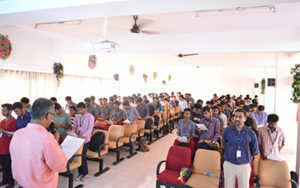 Department of Mechanical Engineering has organized a guest lecture on “INTELLECTUAL PROPERTY RIGHTS” on 20-02-2019 for the benefit of students of VI, VIII semester and faculty members of Mechanical department. 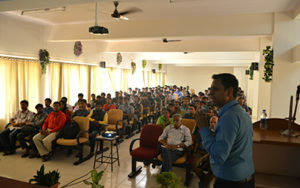 The guest lecture was delivered by Mr. Gopinath A. S., Partner, K & S Partners, Bangalore. 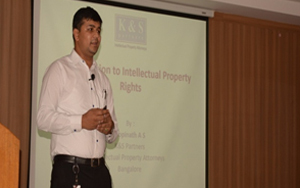 He covered all the areas of IP rights including patents, designs, trademarks, copyright, geographical indications, trade secrets and related matters. He discussed about the nature and extent of available IP protection, searches, assisting in registration of IP rights in the Indian Intellectual Property offices. He also discussed about post registration aspects for enforcement of IP rights through civil and criminal proceedings. Department of Mechanical Engineering has organized a guest lecture on “Fatigue analysis in the frequency domain using artificial neural network” on 11.04.2018 for the benefit of faculty members and students of 6th semester. 80 students took benefit of this session. 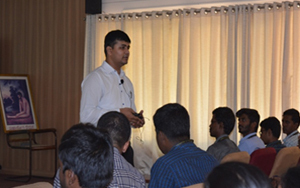 The Guest lecture was delivered by Mr. Shashidhar Ramachandra who is a Ph.D. scholar, Oxford Brookes University, UK. He started with the basics of fatigue analysis and explained various approaches in fatigue analysis. He explained the rainflow counting method and its use in his Ph.D. work. 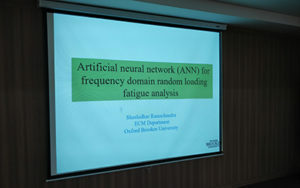 He gave a brief idea about artificial neural network(ANN) and its importance,later he emphasized on his work on ANN and showed various results he has obtained in the course of his PhD work. Department of Mechanical Engineering has organized a guest lecture on “An Approach to Energy Audit and Management” on 15.11.2017 for the benefit of faculty members and students of 5th and 7th semesters. 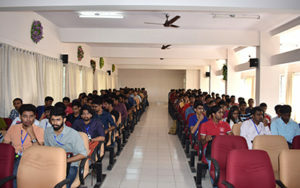 Around 150 students took benefit of this session. 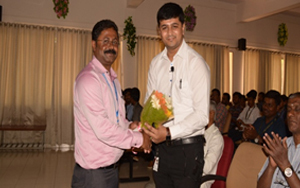 The Guest lecture was delivered by B.VENKATA SUBBAIAH who is a Deputy Director in Power Systems Training Institute, Bangalore. 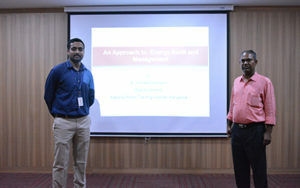 He has emphasized on Energy management, objectives of energy management, need for energy audit, types of energy audit and approach, detailed energy audits, the outcome of pre-audit phase, understanding energy costs, industrial benchmarking programs, energy performance, instruments and metering for energy audit. Department of Mechanical Engineering has organized a guest lecture on “ADVANCED BEARINGS AND ROTOR DYNAMICS” on 20.09.2017 for the benefit of faculty members and students of 7th and 5th semesters. 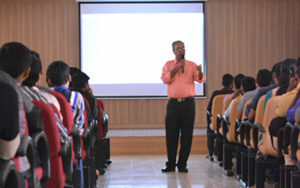 The Guest lecture was delivered by Sadanand S Kulkarni who is a Sr. Scientist in propulsion division of CSIR-NAL, Bangalore. He has emphasized on different types of bearings, working of various bearings its advantages and disadvantages with their various applications. 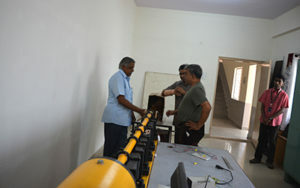 He showed several videos of various tests conducted with the test rig in NAL. He even briefed about rotor dynamics. A Guest lecture was organized on 5th May 2017 in our institution. 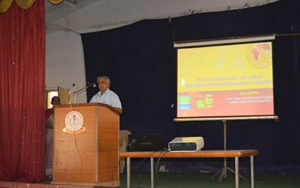 The speaker was Dr. N. K. Gupta, from Indian Institute of Technology, Delhi (IITD). 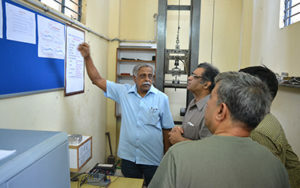 He was shown around the department and research activities were explained to him briefly and discussions about further progress of research area. The topic of the lecture was “Plasto Mechanics of Large Deformation Under Impact Loading”. The lecture was attended by the faculties and all first year students of Vemana IT. He emphasized on the importance of energy absorbers and it scope in the area of impact engineering and as an interdisciplinary activity. 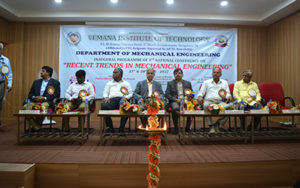 Department of Mechanical Engineering, Vemana Institute of Technology has organized a technical session on “Advanced Automotive Technical Education” in association with RACEDynamics India Pvt. Ltd., on 19.04.2017. The program was inaugurated by Sri. Ln. Muningappa, secretary KRJS. 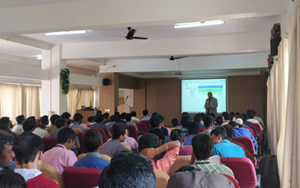 This technical session was attended by students and faculty of Vemana IT. The team has emphasized on Engine Calibration, Demonstration on Vehicle Chassis Dynamometer, Motor Sport Cutting Edge Technology, Modern Automotive Electronics and Control and its vital role in the domain. 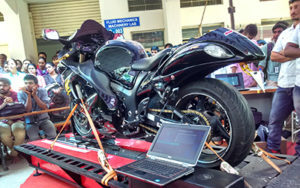 They also gave hands-on experience with respect to diesel/petrol engine calibration and emission standards. 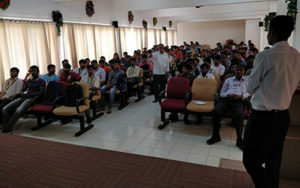 The session ended with interaction with students on basic automotive science. 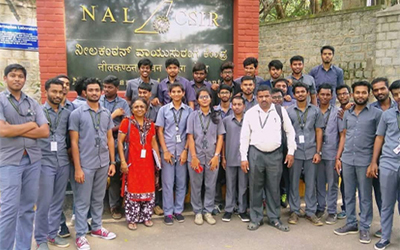 To emphasis more on practical aspects and to strengthen the practical knowledge to 5th semester students, an industrial visit was organized on 26th and 27th September of 2018 to Propulsion Division of National Aerospace Laboratories, Bengaluru. 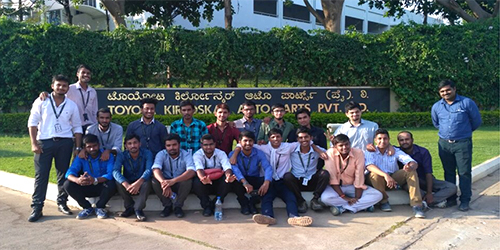 This industrial visit was arranged for better understanding of theoretical concepts of turbomachinery, the subject which they are studying for the current semester. Scientists of NAL showed various testing facilities i.e, wind tunnel, acoustic test, small gas turbine combustor, transonic cascade tunnel, axial flow compressor test rig. In the wind tunnel, it was explained how different component sub assemblies of missiles are tested to verify the adequacy of requirements for the launching. Students were explained the need for acoustic testing to withstand the specified level for subsystems in the reverberation chamber. The distribution pattern of sound inside the chamber with acoustic horns to simulate different levels which the subassemblies will experience during the launch was demonstrated. The schematic of the combustion chamber of the gas turbine with different subassemblies and also the flow distribution of flue gases during combustion has been explained. With this visit, the students had an exposure on various facilities and the need for these facilities for better understanding of theoretical aspects. 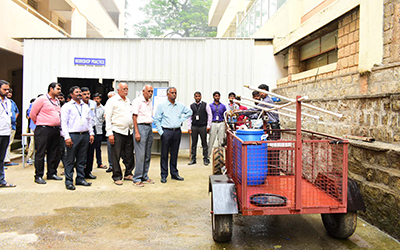 Department of Mechanical Engineering as organised an industrial visit for 2nd year students. 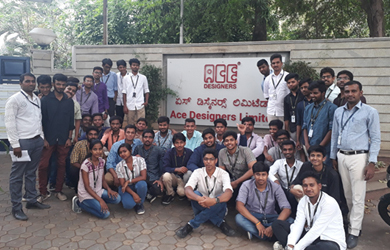 40 students of 4th semester A section accompanied by two faculty members Prof. Rajesh S. and Prof Purushotham Nayaka D.S, on 24th April 2018 visited ACE Designers Limited Bangalore. Students got the exposure on manufacturing of different types of CNC turning centers, advanced measuring systems and the operations performed on it.They also visited the assembly section of CNC machines. 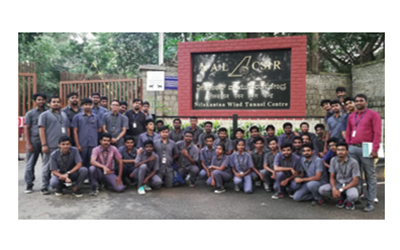 Technical industrial visit was organized by the Mechanical Engineering Department, Vemana Institute of Technology on 28thMarch 2018 for 3rd year students. 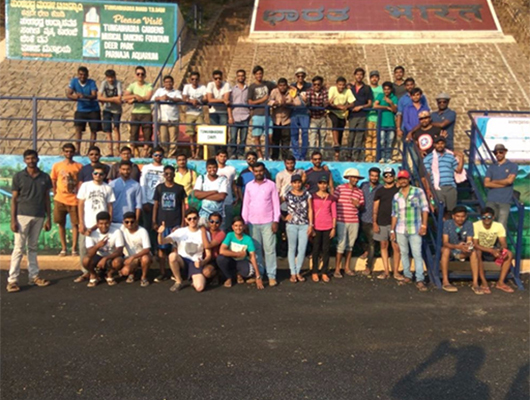 50 students of 6thsemester B section accompanied by two faculty members Prof. Lokesh. 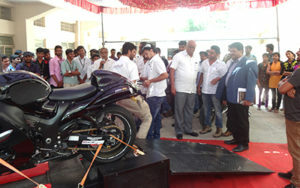 G Reddy and Prof. Rakesh.B.G visited the TVS plant. 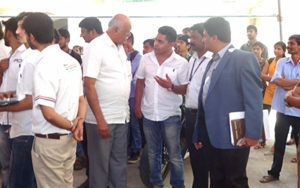 Students got the exposure on latest industrial developments on machining (3 & 5 axis CNC machines), fabrication, painting and on engine assembly (TVS Star, TVS Victor, TVS Apache G310R etc.). 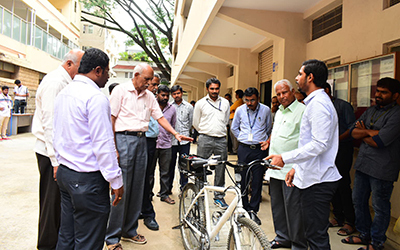 They also visited the inspection site of various bikes. 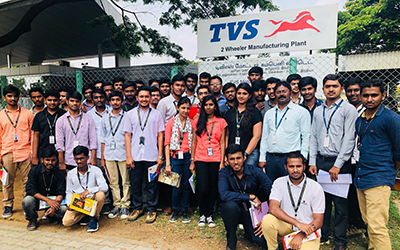 After the visit, students expressed their gratitude to the departmental head Prof. Lokesh.G.Reddy, Prof. Ashwathappa & Naveen Kumar R for organizing the visit to TVS Company. Department of Mechanical Engineering organized an Industial tour to final year students from 26th to 30th of March 2018. 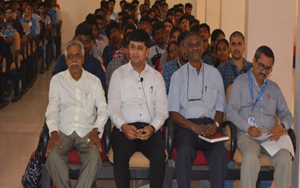 On 26th of March, 57 students of final year accompained by 3 faculty members Prof. Hemanth kumar P, Prof. Naveen Kumar R and Mr. Anand Kumar of Mechanical Engineering Dept. visited Tungabhadra Dam. Tungabhadra dam build across the rivers of thunga and bhadra, the dam is near the town of Hospet in Karnataka. The dam creates the biggest reservoir on the Tungabhadra River with 101 tmcft of gross storage capacity at full reservoir level (FRL) 498 m MSL, and a water spread area of 378 square kilometres. The dam is 49.39 meters high above its deepest foundation. The left canals emanating from the reservoir supplies water for irrigation entirely in Karnataka state. INDUSTRIAL VISIT – ACE DESIGNER PVT LTD.
On 21st and 27th of September mechanical department was organized an industrial visit to third semester A and B section to ACE DESIGNERS PVT LTD, where students were learned about modern foundary practices, melting of pig iron, making moulds, pouring of molten metal to the cavity and testing of moulds in a laboratory etc. This will enriched the knowledge of students. India Manufacturing Show intends to be the catalyst to aculeate the manufacturing sector by bringing together the best talent, the best technologies and the best minds from across the globe while providing excellent learning opportunities for all the students. 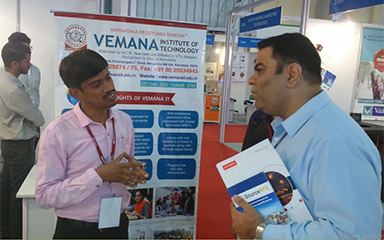 Technical visit to India Manufacturing Show exhibition was organized by the Mechanical Engineering Department, Vemana Institute of Technology on 30th& 31thOctober 2017 for the 3rd year students. 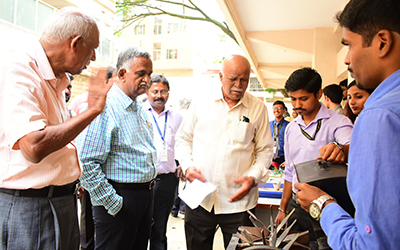 Around 90 students of 5th semester were attended and got exposure of many industrial latest work such as 3D Printing machine, Gear drives, Pumps, Cutting tools and etc. 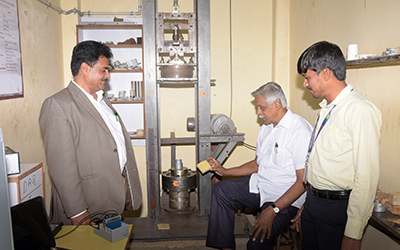 Our college faculties Ashok Kumar C N, Mujeeb Pasha, Rakesh.B.G, Thippeswamy.M.S & PurushothamNayak were exhibited demo on research work on Gas gun for Ballastica pplications & Drop Weihgt Impact Machine.Afterthe visit,students expressed their gratitude to the departmental head Prof. Lokesh.G Reddy& Prof. Ashwathappa for organizing the visit to IMS-2017. On 31st January and 1stFebruary 2017 Visited to the Bangalore international exhibition “IMTEX-2017” was organized by the dept. of mechanical engineering . 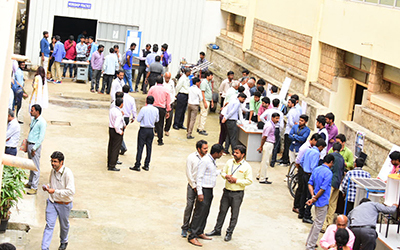 Around 35 students of sixth semester attended the exhibition where they saw modern machining process and tools. They even saw robot demonstration by Siemens. 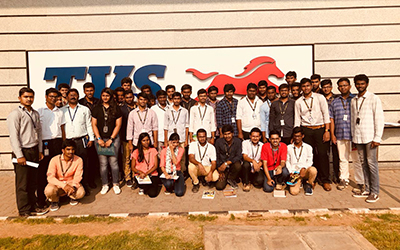 On 31st March around 55 students of VI semester visited Toyota Kirloskar Motor Pvt Ltd. and Toyota Kirloskar Auto Parts, Industrial Area, Bidadi. Students were given more knowledge about Toyota production system (TPS), Just in Time (JIT) production, Produce to Demand Policy and Kanban System adopted in both the plants. 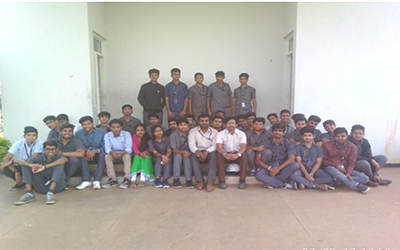 An industrial visit to Bosch Packaging Technology, Verna, Goa was organised from the department of mechanical engineering On 25th March. 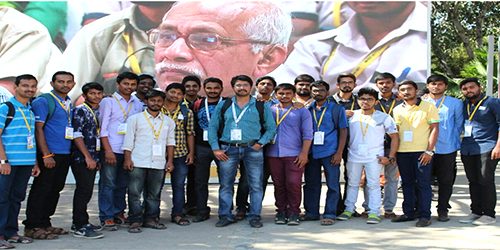 Around 91 students of final year and faculties of Vemana IT got an opportunity to explore the industrial design and application of pneumatics in packaging industries. 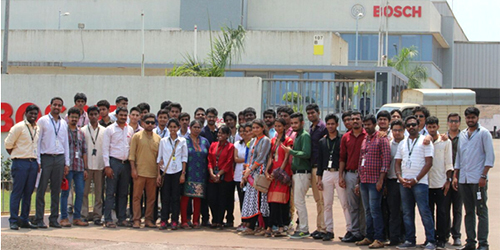 An industrial visit to Bosch Packaging Technology, Verna, Goa was organised from the department of mechanical engineering On 24th march 2017 Around 78 students of final year were taken for the industrial visit to Varahi Underground Power House, Hosangadi, Udupi District, Karnataka where students were given more exposure on hydroelectric power generation. 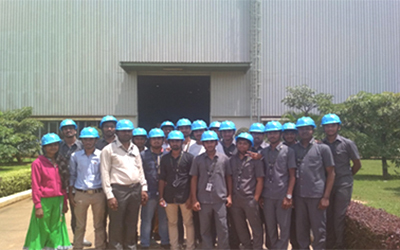 An industrial visit to Bosch Ltd., Bidadi plant was organised from the department of mechanical engineering on 23 rd February 2017. 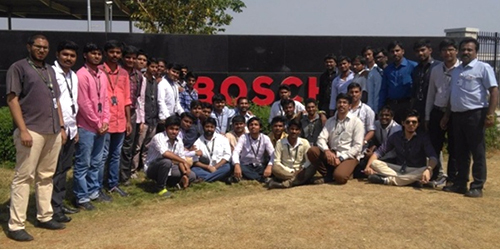 Around 50 students of sixth semester and faculties of Vemana IT got an opportunity to explore the manufacturing facility of Bosch which will manufacture products for the Diesel Systems. 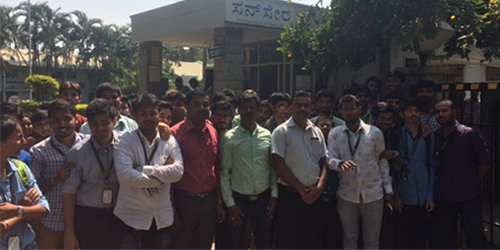 An industrial visit to Sansera Engineering was organised on 28th Sept 2016, around 48 students of Vth semester along with faculties of Vemana IT, visited the plant situated in Bommsandra industrial area, Bengaluru.